SharePoint Portal Server is a portal server that connects people, teams, and knowledge across business processes. SharePoint Portal Server integrates information from various systems into one secure solution through single sign-on and enterprise application integration capabilities. It provides flexible deployment and management tools, and facilitates end-to-end collaboration through data aggregation, organization, and searching. SharePoint Portal Server also enables users to quickly find relevant information through customization and personalization of portal content and layout as well as through audience targeting. Microsoft Windows Services is the engine that allows administrators to create Web sites for information sharing and document collaboration. Windows SharePoint Services provides additional functionality to the Microsoft Office System and other desktop applications, as well as serving as a plat form for application development. SharePoint sites provide communities for team collaboration, enabling users to work together on documents, tasks, and projects. The environment for easy and flexible deployment, administration, and application development. Office SharePoint Server 2007 provides a single integrated platform to manage intranet, extranet, and Internet applications across the enterprise. Business users gain greater control over the storage, security, distribution, and management of their electronic content, with tools that are easy to use and tightly integrated into familiar, everyday applications. Organizations can accelerate shared business processes with customers and partners across organizational boundaries using InfoPath Forms Services–driven solutions. Information workers can find information and people efficiently and easily through the facilitated information-sharing functionality and simplified content publishing. In addition, access to back-end data is achieved easily through a browser, and views into this data can be personalized. Administrators have powerful tools at their fingertips that ease deployment, management, and system administration, so they can spend more time on strategic tasks. Developers have a rich platform to build a new class of applications, called Office Business Applications that combine powerful developer functionality with the flexibility and ease of deployment of Office SharePoint Server 2007. Through the use of out-of-the-box application services, developers can build richer applications with less code. Microsoft Office SharePoint Server 2007 for Internet sites and Microsoft Office SharePoint Server 2007 have identical feature functionality. While the feature functionality is similar, the usage rights are different. If you are creating an Internet, or Extranet, facing website, it is recommended that you use Microsoft Office SharePoint Server 2007 for Internet sites which does not require the purchase client access licenses. Websites hosted using an “Internet sites” edition can only be used for Internet facing websites and all content, information, and applications must be accessible to non-employees. Websites hosted using an “Internet sites” edition cannot be accessed by employees creating, sharing, or collaborating on content which is solely for internal use only, such as an Intranet Portal scenario. See the previous section on licensing for more information on the usage scenarios. SharePoint-based Web sites can be password-protected to restrict access to registered users, who are invited to join via e-mail. In addition, the site administrator can restrict certain members' roles by assigning different permission levels to view post and edit. You can post documents in many formats, including .pdf, .htm and .doc. In addition, if you are using Microsoft Office XP, you can save documents directly to your Windows SharePoint Services site. No you cannot. However, you can exchange contact information lists with Microsoft Outlook. Yes you can. You can have templates for business plans, doctor's office, lawyer's office etc. Hence, please take special care to name your site. These Web sites are ideal for information and knowledge intensive sites and/or sites where you need to have shared Web workspace. Remember: Under each parent Web site, you can create up to 10 sub-sites each with unique permissions, settings and security rights. You can keep track of permissions for each team separately so that access is restricted while maintaining global access to the parent site. Default condition is nothing; your site has restricted access. The default conditions allow you to create a secure site for your Web site. Unfortunately, no. At this point, we don't offer domain names for SharePoint sites. But very soon we will be making this available for all our SharePoint site customers. Please keep checking this page for further update on this. Meanwhile, we suggest you go ahead and set up your site and create content for it. Picture libraries allow you to access a photo album and view it as a slide show or thumbnails or a film strip. You can have separate folder for each event, category, etc. Yes. You can manage this process using the Administration Site Settings. Simply add users via their e-mail alias and assign permissions such as Reader or Contributor. No. You do not need to download any code or plan for any IT support. Simply complete the on-line signup process and provide us your current and correct email address. Once you have successfully signed up and your site has been provisioned, we will send a confirmation to the email address you provided. No. There are no system or bandwidth limitations for international trial users. Additionally language packs have been installed which allow users to set up sub-webs in languages other than English. These include: Arabic, Danish, Dutch, Finnish, French, German, Hebrew, Italian, Japanese, Polish, Portuguese (Brazilian), Spanish and Swedish. Yes. Microsoft recommends using the following browsers for viewing and editing Windows SharePoint Services sites: Microsoft Internet Explorer 5.01 with Service Pack 2, Microsoft Internet Explorer 5.5 with Service Pack 2, Internet Explorer 6, Netscape Navigator 6.2 or later. Reader - Has read-only access to the Web site. Contributor - Can add content to existing document libraries and lists. Web Designer - Can create lists and document libraries and customize pages in the Web site. Administrator - Has full control of the Web site. Microsoft Windows SharePoint Services Technical security measures provide firewall protection, intrusion detection, and web-publishing rules. The Microsoft operation center team tests and deploys software updates in order to maintain the highest level of security and software reliability. Software hot-fixes and service packs are tested and deployed based on their priority and level of risk. Security related hot-fixes are rapidly deployed into the environment to address current threats. A comprehensive software validation activity ensures software stability through regression testing prior to deployment. An internet site is a normal site that anyone on the internet can access (e.g., www.msn.com, www.microsoft.com, etc.). You can set up a site for your company that can be accessed by anyone without any user name and password. The internet is used for public presence and a primary marketing tool managed typically by web programmers and a system administrator. An intranet (or internal network), though hosted on a Web site, can only be accessed by people who are members of a specific network. They need to have a login and password that was assigned to them when they were added to the site by the site administrator. The intranet is commonly used as an internal tool for giving employees access to company information. Content is driven by business relevance, business rules and has increasingly become a common tool in larger organizations. An intranet is becoming more and more the preferred method for employees to interact with each other and the central departments in an organization, whether or not the organization has a Web presence. A site or workspace is when you want a new place for collaborating on Web pages, lists and document libraries. For example, you might create a site to manage a new team or project, collaborate on a document or prepare for a meeting. User permissions apply to an entire Web, not to documents themselves. However, you can have additional sub webs that can optionally have their own permissions. Each user can be given any of four default roles. Additional roles can be defined by the administrator. There is no restriction in place except that any storage consumed beyond that provided by the base offering may have an additional monthly charge associated with them. The only files restricted are those ending with the following extensions: .asa, .asp, .ida, .idc, .idq. Microsoft reserves the right to add additional file types to this listing at any time. Also, no content that violates the terms of service may be uploaded or posted to the site. SharePoint data can be opened with Access and Excel as an external data source. Thus, SharePoint can be referenced as an external data source. SharePoint itself cannot reference an external data source. SharePoint 2007 Portal Server (MOSS2K7) allows connections to SQL based datasources via the Business Data Catalog (BDC). The BDC also allows connecting to data via Web Services. Or you can link lists directly with sql queries in the list settings using the BDLC found here: http://bit.ly/p30tJ . YES! Windows SharePoint Services makes updating sites and their content from the browser easier than ever. SharePoint includes tools that let you create custom lists, calendars, page views, etc. You can apply a theme; add List, Survey and Document Library Web Parts to a page; create personal views; change logos; connect Web Parts and more. To fully customize your site, you can use Microsoft FrontPage 2003. Specifically, you can use FrontPage themes and shared borders, and also use FrontPage to create photo galleries and top ten lists, utilize standard usage reports, and integrate automatic Web content. Manage content and streamline processes. Comprehensively manage and control unstructured content like Microsoft Office documents, Web pages, Portable Document Format file (PDF) files, and e-mail messages. Streamline business processes that are a drain on organizational productivity. Improve business insight. Monitor your business, enable better-informed decisions, and respond proactively to business events. Find and share information more simply. Find information and expertise wherever they are located. Share knowledge and simplify working with others within and across organizational boundaries. Empower IT to make a strategic impact. Increase responsiveness of IT to business needs and reduce the number of platforms that have to be maintained by supporting all the intranet, extranet, and Web applications across the enterprise with one integrated platform. Office SharePoint Server 2007 capabilities can help improve organizational effectiveness by connecting people, processes, and information. Office SharePoint Server 2007 provides these capabilities in an integrated server offering, so your organization doesn't have to integrate fragmented technology solutions itself. The portal components of Office SharePoint Server 2007 include features that are especially useful for designing, deploying, and managing enterprise intranet portals, corporate Internet Web sites, and divisional portal sites. The portal components make it easier to connect to people within the organization who have the right skills, knowledge, and project experience. Office SharePoint Server 2007 builds on the core document management functionality provided by Windows SharePoint Services 3.0, including check in and check out, versioning, metadata, and role-based granular access controls. Organizations can use this functionality to deliver enhanced authoring, business document processing, Web content management and publishing, records management, policy management, and support for multilingual publishing. Yes. SharePoint Team Services provides a powerful text-based search feature that helps you find documents and information fast. A consistent and familiar search experience. Increased relevance of search results. New functions to search for people and expertise. Provide a simple, familiar, and consistent user experience. Boost employee productivity by simplifying everyday business activities. Help meet regulatory requirements through comprehensive control over content. Effectively manage and repurpose content to gain increased business value. Simplify organization-wide access to both structured and unstructured information across disparate systems. Connect people with information and expertise. Accelerate shared business processes across organizational boundaries. Share business data without divulging sensitive information. Enable people to make better-informed decisions by presenting business-critical information in one central location. Provide a single, integrated platform to manage intranet, extranet, and Internet applications across the enterprise. The products will come together because they are both developed by the Office team. If an assembly is installed into the BIN directory, the code must be ensured that provides error handling in the event that required permissions are not available. Otherwise, unhandled security exceptions may cause the Web Part to fail and may affect page rendering on the page where the Web Part appears. In a development environment, increasing the trust level allows you to test an assembly with increased permissions while allowing you to recompile assemblies directly into the BIN directory without resetting IIS. This option is least secure. This option affects all assemblies used by the virtual server. There is no guarantee the destination server has the required trust level. Therefore, Web Parts may not work once installed on the destination server. Easy to implement. This grants Full trust to your assembly without affecting the trust level of assemblies installed in the BIN directory. Yes and no. It can crawl documents on an NFS volume, but the sharepoint database or logs cannot be stored there. Site Server has search capabilities but these are more advanced using SharePoint. SPS uses digital dashboard technology which provides a nice interface for creating web parts and showing them on dashboards (pages). SS doesn't have anything as advanced as that. The biggest difference would be SPS document management features which also integrate with web folders and MS Office. Planning an enterprise deployment using SharePoint features is a very difficult task unless you can establish a Service Oriented Architecture, using AD for managing security with well-defined roles based information access (EISA). Sounds reasonable, although it seems difficult to deploy with the tools limitations in document storage. Document management does not scale beyond a single server, but scales great within a single server. For example, a quad Xeon machine with 4GB of RAM works great for a document management server that has about 900,000 - 1,000,000 document, but if you need to store 50,000,000 document and want to have them all in one single workspace then it does not scale at all. If you need a scenario like this, you need to plan your deployment right and it should scale for you, it just does not right out of the box. If you are using your server as a portal and search server most for the most part it scales great. You can have many different servers crawl content sources and have separate servers searching and serving the content. If you have < 750,000 documents per server and fewer than 4 content sources and fewer than 50,000 users, SPS should scale just fine for your needs with the proper planning. SharePoint Portal Services (SPS) has MUCH better document management. It has check-in, check-out, versioning, approval, publishing, subscriptions, categories, etc. STS does not have these features, or they are very scaled back. SharePoint Portal Services (SPS) has a better search engine, and can crawl multiple content sources. STS cannot. STS is easier to manage and much better for a team environment where there is not much Document Management going on. SPS is better for an organization, or where Document Management is crucial. The browser sends a DAV packet to IIS asking to perform a document check in. PKMDASL.DLL, an ISAPI DLL, parses the packet and sees that it has the proprietary INVOKE command. Because of the existence of this command, the packet is passed off to msdmserv.exe, which in turn processes the packet and uses EXOLEDB to access the WSS, perform the operation and send the results back to the user in the form of XML. If World Wide Web Publishing Service (W3SVC) starts before Microsoft Exchange Information Store (MSExchangeIS), “stop sign” symbols appear under the Default Web Site folder of the Internet Information Services console in Microsoft Management Console (MMC). There is a dependency between the local paths of the SharePoint Portal Server virtual directories and the MSExchangeIS. You must start MSExchangeIS first, followed by W3SVC. Change the Startup type for W3SVC to Manual. Restart the server. The MSExchangeIS service starts automatically. Technically SharePoint illustrates neatly what Microsoft's .net strategy is all about: integrating Windows with the Web. Microsoft has previously made accessing stuff on a PC easier, (Windows) then on a network (NT) and now on the web (.NET). SharePoint is an application written to let a user access a web accessible directory tree called the Web Storage System. SharePoint was written with a set of technologies that allow the programmer to pass data, functions, and parameters over HTTP, the web's medium. These are XML, XSL and SOAP, to name a few I understand the basics of! To the user it looks easy, like Hotmail, but every time they click a button or a link, a lot has to happen behind the scenes to do what they want to do quickly and powerfully. Not as easy as you might think, but SharePoint does it for you. Accessing this Web storage system and the server itself is also done using technologies like ADO, CDO, PKMCDO, LDAP, DDSC, ADSC. More on these later. SharePoint is a great example of how the Internet Platform can be extended and integrated into an existing well adopted technology, Windows. Administering SharePoint mainly consists of setting it up, which is much easier than you expect, adding the content, which can be just dragging and dropping in whole directory structures and files, and then organizing the files better by giving them categories or other metadata. This is done either through the Web interface or through the SharePoint Client: a program what means you can access SharePoint as a Web folder and then right-click files to select options like "edit profile". Or add files by dragging them in individually or in bulk. Setting the security is also important, using NT accounts, either NT4 or Active Directory (or both in mixed mode) you can give users access to files/folders the same way as you do in standard Windows. Users can be grouped and the groups given access privileges to help manage this better. Also SharePoint has 3 Roles that a User or Group can be given on a particular item. Readers can see the item (i.e. document/file or folder) but not change it, Authors can see and edit items and coordinators can set security privileges for the part of the system they have control over. Thus, you could set 12 different coordinators for 12 different folder trees, and they could manage who can do what within that area only. What is SharePoint from a User’s Perspective? From a User’s perspective SharePoint is a way of making documents and folders on the Windows platform accessible over the web. The user visits the SharePoint Portal web page, and from there they can add documents, change documents & delete documents. Through this Portal, these documents are now available for discussion, collaboration, versioning and being managed through a workflow. Hence the name "Share-Point". Details about the document can be saved too, such as: who wrote it, when, for whom, its size, and version, category or target audience. These can then be used to find the document through SharePoint's Search facility. Even documents not "in" SharePoint can be included in the search engine's index so they become part of the portal. All in all, it's a great way to get stuff up on the web for users with average technical skills, and for administrators to manage the content. This is a button on contacts or events lists that lets Outlook 2003 add a pst file named SharePoint Folders and it links to the data on the site. It’s read-only, but you could make the home page for that PST be the SharePoint site for easier viewing. The link to outlook feature seems more to be where some can public a calendar, but not want too much collaboration. For example, a holiday schedule, company meeting schedule, etc., can be made available for people to be able to view from Outlook without having to go to a web browser. Another nice thing about OL2K3 is that you can compare these calendars with others side by side. With SPS you can index Exchange’s public folders with the search engine so that all that precious public folder content is searchable. You’ll want to look at content sources and indexing in SharePoint administration. Since exchange web-enables public folders, you can create a web part that displays that content. IE, http://exchangeserver/Public/IT/Helpdesk will display the IT/Helpdesk public folder via OWA. So you add the Page Viewer web part to a page and point it at that URL. The key here is to add? cmd=contents to the end of the url if you don’t want the navigator pane on the left. Some of the web parts that come with SPS allow you to add a web part to a page that actually takes the users outlook info (calendar, inbox, contacts, tasks) and put them into the page. "In Word 2003, you can compare documents side by side. Open two documents. Then, from the Window menu of one of them, select the Compare Side By Side command. If you have only two documents open, the command will automatically choose to compare them. If you have three or more documents open, you'll have to select which document to compare with the current file. A floating toolbar with two buttons will open. If the button on the left is selected, Word will scroll both documents at the same time. Press the button on the right side of the toolbar to return to where the cursor was located when you started comparing." SPS webpage can detect you have installed the Office 2003 and run local dll to implement some SPS function, e.g. multi-file upload only works when you have office 2003 installed. Integration with Office XP is gone. You will get guys telling you that you can integrate with SPSv2 if you install a backwards compatible document library - but that’s really just putting a bit of SPS 2001 on the server. Believe me, check-in, check-out, which are themselves very basic, are not available from inside Office XP, or even from the context menu in Windows Explorer. The ONLY option you have is to use the web interface to check-in or check-out. SharePoint: A collection of products and software elements which includes InternetExplorer based collaboration functions, modules of process management, search modules and a platform for document management. Share Point can be used for web hosting web sites which access the shared workspaces, information stores and documents, and host defined applications such as blogs. - Provides platform which includes server administration, application extensibility and interoperability for IT professionals. - Web site creation for information sharing and document collaboration is treated as services by SharePoint Portal Server. What is Windows SharePoint Services? What is a SharePoint site definition? A SharePoint site definition is a combination of files which reside on the Web server and defines a unique SharePoint site. Every template on the web site tab of New dialog box is utilized a site definition. For example, one site definition defines the Team site, Bank site and another site definition defines the Meeting workspaces like Basic Meeting Workspace, Decision Meeting Workspace, and Social Meeting Workspace etc. CAML is an acronym for Categorical Abstract Machine Language. CAML is statically typed, strictly evaluated, and uses memory management automatically. LISP is the first CAML implementation. CAML Light was implemented in C. CAML Special Light is added a powerful module system to the core language, in addition to complete rewriting, Objective CAML is the current implementation of CAML, which adds an object layer. Can you personalize Shared Services for a single Web application? You cannot assign or un-assign few services to a web application. If the web application is using a particular SSP, it has to bear the burden of all the services configured in that SSP. Unlike site pages (for example, default.aspx), a custom application page is deployed once per Web server and cannot be customized on a site-by-site basis. Application pages are based in the virtual _layouts directory. In addition, they are compiled into a single assembly DLL.A good example of an Application Page is the default Site Settings page: every site has one, and it's not customizable on a per site basis (although the contents can be different for sites). With application pages, you can also add inline code. With site pages, you cannot add inline code. Typically, you link custom application pages to application.master, the master page file that is used by the default application pages in Windows SharePoint Services. You should also write application pages to inherit from a base class defined inside the Microsoft.SharePoint assembly named LayoutsPageBase. In SharePoint Object model there are two Important namespaces, Microsoft.Office.Server and Microsoft.SharePoint . The Microsoft.Office.Server namespace is the root namespace of all Office Server objects and Microsoft.SharePoint is the root namespace for all WSS objects. Q. How Do you bind a Drop-Down Listbox with a Column in SharePoint List ? Method 1: You can get a datatable for all items in the list and add that table to a data set. Finally, specify the dataset table as datasource for dropdown listbox. Method 2: You can also use SPDatasource in your aspx or design page. Q. What are the various tools used for creating the solutions? SharePoint Portal Server is the global portal offering features like global navigation and searching. Windows SharePoint Services is more content management based with document libraries and lists. You apply information to certain areas within your portal from Windows SharePoint Services or directly to portal areas. A document library is where you upload your core documents. They consist of a row and column view with links to the documents. When the document is updated so is the link on your site. You can also track metadata on your documents. Metadata would consist of document properties. Document workspaces consist of information surrounding a single or multiple documents. Web parts consist of xml queries to full SharePoint lists or document libraries. You can also develop your own web parts and web part pages. Document libraries consist of your core documents. An example would be a word document, excel, powerpoint, visio, pdf, etc… Form libraries consist of XML forms. Web part zones are what your web parts reside in and help categorize your web parts when designing a page. It’s a method for providing prepackaged site and list content. A template is a pre-defined set of functions or settings that can be used over time. There are many templates within SharePoint, Site Templates, Document Templates, Document Library and List Templates. Web Parts should be distributed as a .CAB (cabinet) file using the MSI Installer. stands for Collaborative Application Markup Language and is an XML-based language that is used in Microsoft Windows SharePoint Services to define sites and lists, including, for example, fields, views, or forms, but CAML is also used to define tables in the Windows SharePoint Services database during site provisioning. The file extension of a web part. Global Assembly Cache folder on the server hosting SharePoint. You place your assemblies there for web parts and services. Web Part Page Gallery is the default gallery that comes installed with SharePoint. Site Gallery is specific to one site. Virtual Server gallery is specific to that virtual server and online gallery are downloadable web parts from Microsoft. The pages in a Web site generally cover one or more topics and are interconnected through hyperlinks. Most Web sites have a home page as their starting point. While a Web is simply a blank site with SharePoint functionality built in; meaning you have to create the site from the ground up. Windows SharePoint Services is the solution that enables you to create Web sites for information sharing and document collaboration. Windows SharePoint Services — a key piece of the information worker infrastructure delivered in Microsoft Windows Server 2003 — provides additional functionality to the Microsoft Office system and other desktop applications, and it serves as a platform for application development. * Business users gain greater control over the storage, security, distribution, and management of their electronic content, with tools that are easy to use and tightly integrated into familiar, everyday applications. * Organizations can accelerate shared business processes with customers and partners across organizational boundaries using InfoPath Forms Services–driven solutions. * Information workers can find information and people efficiently and easily through the facilitated information-sharing functionality and simplified content publishing. In addition, access to back-end data is achieved easily through a browser, and views into this data can be personalized. * Developers have a rich platform to build a new class of applications, called Office Business Applications that combine powerful developer functionality with the flexibility and ease of deployment of Office SharePoint Server 2007. Through the use of out-of-the-box application services, developers can build richer applications with less code. Hence, please take special care to name your site. These Web sites are ideal for information and knowledge intensive sites and/or sites where you need to have shared Web workspace. Remember: Under each parent Web site, you can create up to 10 sub-sites each with unique permissions, settings and security rights. An internet site is a normal site that anyone on the internet can access (e.g., www.msn.com, www.microsoft.com, etc.). You can set up a site for your company that can be accessed by anyone without any user name and password. An intranet (or internal network), though hosted on the Web, can only be accessed by people who are members of the network. They need to have a login and password that was assigned to them when they were added to the site by the site administrator. This is possible via a custom application, but it not natively supported by SharePoint or SQL Server. * A consistent and familiar search experience. * Increased relevance of search results. * New functions to search for people and expertise. * Improved manageability and extensibility. * Provide a simple, familiar, and consistent user experience. * Boost employee productivity by simplifying everyday business activities. * Help meet regulatory requirements through comprehensive control over content. * Effectively manage and repurpose content to gain increased business value. * Simplify organization-wide access to both structured and unstructured information across disparate systems. * Connect people with information and expertise. * Accelerate shared business processes across organizational boundaries. * Share business data without divulging sensitive information. * Enable people to make better-informed decisions by presenting business-critical information in one central location. * Provide a single, integrated platform to manage intranet, extranet, and Internet applications across the enterprise. Provides a nice interface for creating web parts and showing them on dashboards (pages). SS doesn't have anything as advanced as that. The biggest difference would be SPS document management features which also integrate with web folders and MS Office. Document management does not scale beyond a single server, but scales great within a single server. For example, a quad Xeon machine with 4GB of RAM works great for a document management server that has about 900,000 1,000,000 document, but if you need to store 50,000,000 document and want to have them all in one single workspace then it does not scale at all. If you need a scenario like this, you need to plan your deployment right and it should scale for you, it just does not right out of the box. If you are using your server as a portal and search server most for the most part it scales great. You can have many different servers crawl content sources and have separate servers searching and serving the content. The browser sends a DAV packet to IIS asking to perform a document check in. PKMDASL.DLL, an ISAPI DLL, parses the packet and sees that it has the proprietary INVOKE command. Because of the existence of this command, the packet is passed off to msdmserv.exe, who in turn processes the packet and uses EXOLEDB to access the WSS, perform the operation and send the results back to the user in the form of XML. # Change the Startup type for W3SVC to Manual. # Restart the server. The MSExchangeIS service starts automatically. SharePoint was written with a set of technologies that allow the programmer to pass data, functions, parameters over HTTP, the web's medium. These are XML, XSL and SOAP, to name a few I understand the basics of! From a Users perspective SharePoint is a way of making documents and folders on the Windows platform accessible over the web. The user visits the SharePoint Portal web page, and from there they can add documents, change documents & delete documents. Through this Portal, these documents are now available for discussion, collaboration, versioning and being managed through a workflow. Hence the name "Share-Point". Details about the document can be saved too, such as: who wrote it, when, for whom, its size, and version, category or target audience. These can then be used to find the document through SharePoint's Search facility. Even documents not "in" SharePoint can be included in the search engine's index so they become part of the portal. All in all, it's a great way to get stuff up on the web for users with average technical skills, and for administrators to manage the content. This is a button on contacts or events lists that lets Outlook 2003 add a pst file named Sharepoint Folders and it links to the data on the site. It’s read-only, but you could make the home page for that PST be the Sharepoint site for easier viewing. The link to outlook feature seems more to be where some can public a calendar, but not want too much collaboration. For example, a holiday schedule, company meeting schedule, etc, can be made available for people to be able to view from Outlook without having to go to a web browser. Another nice thing about OL2K3 is that you can compare these calendars with others side by side. Since exchange web-enables public folders, you can create a web part that displays that content. IE, http://exchangeserver/Public/IT/Helpdesk will display the IT/Helpdesk public folder via OWA. So you add the Page Viewer web part to a page and point it at that URL. The key here is to add ?cmd=contents to the end of the url if you don’t want the navigator pane on the left. We often face a situation where we need to copy a big workflow from list or library to another list or library. This situation can be avoided if we have created the workflow as reusable workflow. So in this article I will explain in simple steps on how to copy a list workflow to another workflow using SharePoint designer. Using this method we can copy workflow across site collections are web applications. 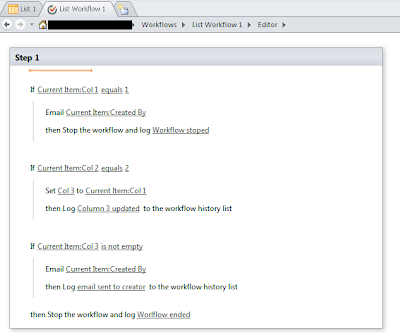 Step 1) We have the list 1 with list workflow 1 to be copied to list workflow 2. Hi guys in this tutorial you will get to know how to identify whether a user is part of a Share point group in InfoPath form. In this example we will use the logged in persons user name is in IT SP group. If he is in the IT SP group we will enable Submit Button and If he is not in the IT SP group we will enable Submit to IT button. Go to the SP site. Go to People and groups and create a group IT. And Add users to the group. Added test user 1 in the SP group.